aka Rayborne Creek, Rabon Creek. 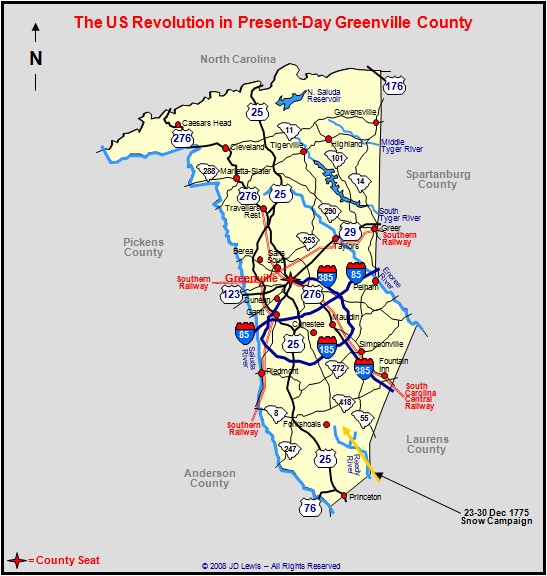 November and December 1775  The Snow Campaign - The Spartan Regiment and other Patriots, under Col. Richard Richardson, set out to attack a Loyalist unit that had camped in Indian territory (present-day Greenville County) for safety. Thomas Sumter participated in this march as Col. Richardson's Aide-de-Camp with the rank of a Militia Captain. The Patriots marched through several feet of snow in early December to accomplish this. 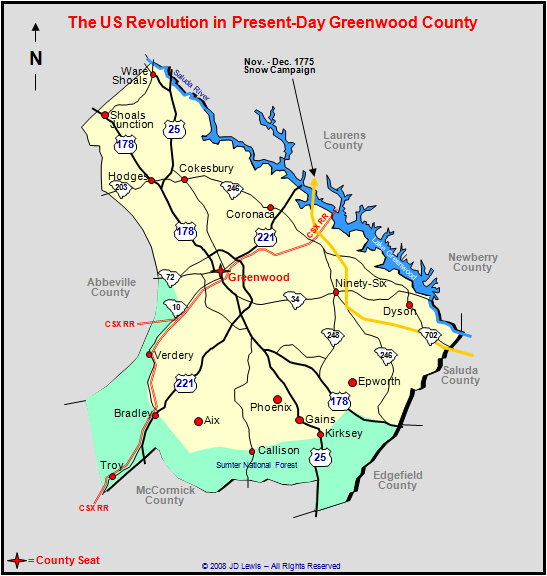 Col. Richardson arrived with a relief force after the Siege of Ninety-Six in mid-November of 1775. The Loyalists, abiding by the terms of the "treaty," had disbanded most of their forces. Col. Richardson refused to abide by the "treaty" and rounded up their leaders and sent them to Charlestown under arrest. 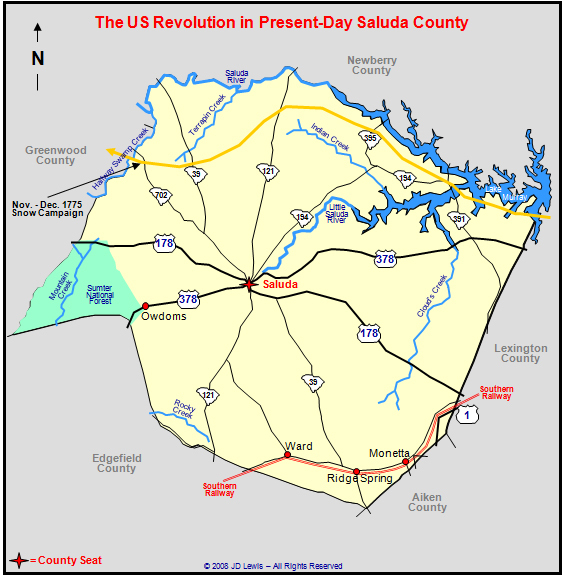 As soon as the army was collected at Fort Granby the line of march was begun by way of Weaver's Ferry on the Saluda River. 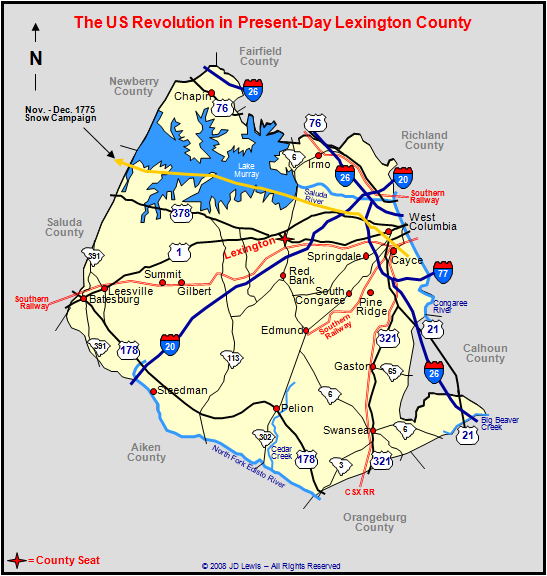 On December 22nd, Col. Richardson detached 1,300 troops to attack the camp of Capt. Patrick Cunningham that had stopped to rest on Cherokee lands. Capt. Cunningham warned his men to fend for themselves and they all ran into the woods. He was able to escape on horseback and hide at a camp at the Great Cane Break on Reedy River. Col. Thomas Fletchall was found hiding in a hollow sycamore tree on Fair Forest Creek, and was sent down to Charlestown with a company of Patriots. After Capt. 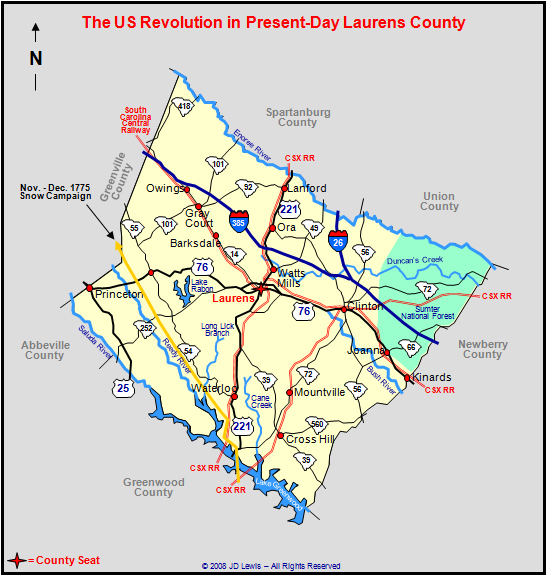 Patrick Cunningham had been defeated at Great Cane Brake, Col. Richardson considered the upcountry to be pacified and turned his army homeward. He couldn't stay because winter was coming and his army had no tents, their shoes were worn out, and they were badly clothed. Along the way home, it snowed for thirty hours, dumping nearly two feet on the weary Patriots. - Capt. Richard Richardson, Jr.
- Capt. John Thomas, Jr.
- Capt. James Butler, Sr.
David Fanning is said to have been in this engagement.